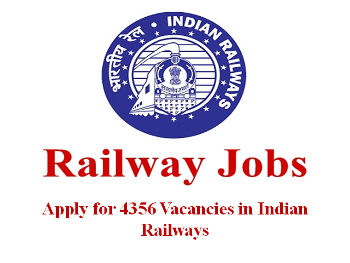 Railways Jobs: Apply for 4356 Vacancies of Trainee, Maintainer, Software Engineer, Assistant, etc. Indian Railways has issued various notifications of Railway Recruitment for Sports and Other Quota Jobs & various other jobs in the month of October 2016. Candidates who are desirous to apply for Railway Jobs under Sports and Other Quota or other jobs can apply. Indian Railways under Ministry of Railways has announced for 4356 vacancies of Trainee, Maintainer, Software Engineer, Assistant, etc under railway recruitment 2016. All those candidates who want to be a part of Govt Job and most importantly in Indian Railways job can apply for the posts through the prescribed format. Railway job aspirants won’t be getting this opportunity later therefore, all candidates who are interested and fulfill the eligibility conditions set by Indian Railways can apply for the relevant posts. As per the latest updates, fourteen organizations/regions under Ministry of Railways are hiring candidates which includes: Central Railway, Noida Metro Rail Corporation, KRCL, Indian Port Rail Corporation, West Central Railway and many more. Indian Railways is hiring for the posts of Apprentice, Maintainers, Assistant Software Engineer, Accounts Assistant, GM, AGM, Trade Apprentice, Senior House Surgeon, Trainees, Sr. Technical Asst, Project Engineer, Sportspersons, Registrar, Engineer, Assistant, Assistant Officer and many other posts. This is a golden opportunity so all those candidates who are willing to apply must not give a second thought to it. All the interested and eligible candidates who are keen to join Indian Railways can apply through the prescribed format along with required documents on or before the last date of application. Government Jobs are most desiring for individuals and attaining a Railway Job adds on to the store of luck. So, here now you can apply for the vacant posts under Railway Recruitment 2016 on or before the last date of application.